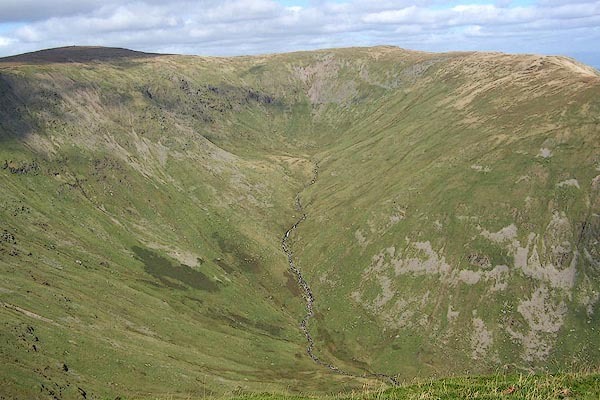 The Kent rising in Kentmere, receives the Sprint from Longsleddale, and the Mint from Bannisdale. It washes the skirts of Kendal, and enters the sea near Milnthorp, where it is joined by the Belo. stones found in the beds of the rivers Kent and Lune; thus furnishing materials for paving the streets, and repairing the roads in the vicinity. The rivers of this county [Westmorland] are but small, and only three that can properly be called rivers carry their name to the sea: ... The 3d is Kent which rises in Kentmere and washes the vale which from thence receives the name of Kendale, and empties itself into the sea below Levens. "Kent river is of a good depth not well to be occupyed with botes for rowlling stones and other moles. Yt risith of very many heddes be likelihood springing within the same shire. A 2 mile about Kendale they come to one good botom and Kentdale town that standeth on the west side of it. Seven or 8 miles from Kendale is a mere commonly called Kenmore." In it is a salmon leap. ... The side of the Kent is famous for petrifying springs, that incrust vegetable bodies, such as moss, leaves of trees, &c. There is one on the park [Levens Park], called the Dropping-well. [from the castle] ... There is a good view of the town and river, with a fertile open valley, though which it winds. Wiggly line; from Kentmere Tarn. 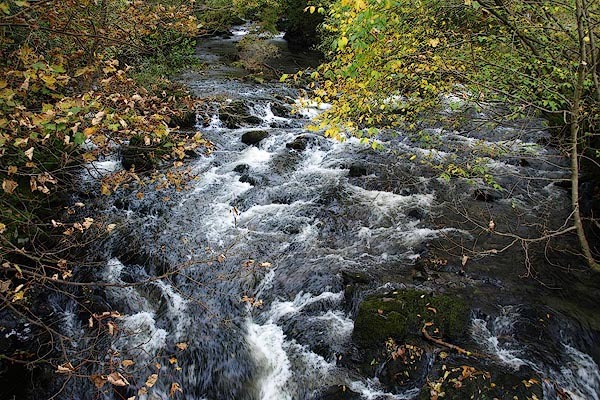 The River Can, Ken, or Kent, rises at Kentmere, and being joined by two large Rivers before it comes to Kendale, they render it a large Stream, with which is passeth thro' a Stony Channel abounding with Fish, into Solway Frith. and running through Kendal to the north. Double wiggly line tapering to single. River, naiad pouring out water; his rivers are muddled.. Flowing from east of Kendal to the sea. summertime; view of a small forge standing in centre of composition on a grassy islet formed by the convergence of a shallow hillside stream and the River Kent. Composition is framed to left by a tall tree. Painting, watercolour, View on the River Kent, Force Bridge, Sedgwick, Westmorland, by Paul Sandby, 1760s-70s. Foreshortened view of the small natural weir of a river spanned in centre of composition by a stone bridge. Trees line either bank. Painting, watercolour, View of Force Bridge and a Fall of the River Kent Five Miles South of Kendal, Sedgwick, Westmorland, by Paul Sandby, 1760s-70s.